UPDATE II (10/15/2012, 10:46am) — Michael Levi has a new paper in the Journal of Geophysical Research in which he finds NOAA’s methane leakage estimates to be “unsupportable” based on what he terms the “wrong interpretation” of the data. NOAA famously — or perhaps infamously — claimed leakage was as high as 7.7 percent, with an average of about four percent. Levi, however, finds the rate to be a fraction of that: one to two percent, which is in line with what other credible studies have found. Among NOAA’s errors of analysis, according to Levi, is that “Colorado has imposed tough rules on methane emissions since the NOAA data was collected in 2008,” a fact that we at EID also highlighted shortly after release of the paper in February (see below). Chilling. Especially the part about complicated math. There’s just one problem – the story about methane emissions isn’t scary at all, once you hear the facts that NPR left out. True, the EPA’s current estimates say oil and gas systems are the nation’s “largest human-made source of methane emissions.” But even so, the estimated total is still a tiny fraction of overall U.S. greenhouse gas emissions – only 3.8 percent, according to the EPA. NPR also failed to mention that oil and gas systems only became the EPA’s number-one source of methane emissions when the agency arbitrarily doubled its estimate last year. Before the EPA simply changed a few numbers in a spreadsheet, farm animals were the biggest source of methane emissions. But that kind of detail might invoke sympathy towards the oil and gas industry – or menace towards cows – so NPR decided to leave it out. NPR also concealed from its audience that oil and gas companies are monitoring their methane emissions today, in accordance with the EPA’s newly established mandatory GHG registry. The first reports will be submitted to the EPA in September, and this huge data set will provide unprecedented clarity about the real level of methane emissions. But that’s less-than-scary, and the regulation that requires the monitoring has a boring name that sounds like part of the tax code – Subpart W. So NPR just left all those facts out, too. As for NOAA’s paper, NPR spends considerable time profiling the author, detailing her “painstaking, on-the-ground detective work” and finding frightening ways to describe her findings, like “very high levels of methane gas” and “chemical cocktail.” EID has no quarrel with Gabrielle Pétron. In fact, we’re glad Pétron went to the trouble of having her findings peer reviewed, unlike some other NOAA scientists in Colorado. But nowhere does NPR mention any of the study’s shortcomings. As EID has detailed previously (see below), the measurements in this study predate Colorado regulations that required major cuts in smog-forming emissions and methane. In effect, that means the study’s findings significantly overstate the real level of methane emissions from Colorado oil and gas operations today. NPR also omitted another less-than-scary fact about the NOAA study. The “very high levels” of methane were actually lower than NOAA recorded at another observation tower in the middle of the Chequamegon National Forest in Wisconsin. Perhaps worst of all, NPR also failed to mention that the EPA recently finalized federal regulations for oil and gas development that will lead to major reductions in methane emissions. That’s right – on top of monitoring methane, the federal government is demanding oil and gas companies cut those emissions, too. While the industry still has major concerns about the workability of the new EPA rules, it’s hard to imagine why a news report about methane emissions would fail to mention a new regulatory program that will cut methane emissions. Unless, of course, it makes for a scarier story if you talk about potential problems as if there are no solutions. To hear the folks at Nature and the Denver Post tell it, a recent study from the National Oceanic and Atmospheric Administration (NOAA) and the University of Colorado proves that producers in the Denver-Julesburg Basin of northeast Colorado are losing four percent of their total production of natural gas – frittered away, right into thin air. Some have even suggested the study validates the Howarth paper from last year, including the discredited professor himself. Unfortunately for Prof. Howarth, the deeper you dig into the DJ Basin report, the clearer it becomes that the NOAA paper isn’t at all comparable to the Howarth paper – mostly, for starters, because they study two entirely different things. What’s far less clear: the extent to which NOAA’s conclusions are even relevant anymore in a modern operating context, given that most of the agency’s data is nearly half a decade old. The study claims that large and small condensate tanks are “estimated to be the largest VOC fossil fuel production source category (59% and 9% respectively)” (NOAA study, p. 6-7). The mobile lab samples analyzed for the study were taken in 2008. But in February 2009, new regulations for the state of Colorado went into effect that included requirements on condensate tanks, including the use of surveillance systems and auto-igniters to dramatically reduce emissions. (Code of Colorado Regulations, 5 CCR 1001-9, XII). Colorado’s Air Pollution Control Division: “New and existing condensate tanks emitting 20 tons per year or more of VOCs [are] required to control emissions by 95 percent.” In Weld County, the area of study for the NOAA report, the APCD notes that VOCs must be controlled by 70 to 90 percent. (APCD, accessed on February 22, 2012). U.S. EPA: Reducing VOCs will “yield a significant environmental co-benefit by reducing methane emissions” as well (EPA, July 2011 [PDF]). The EPA also assessed that its plan to reduce VOCs by 25 percent would yield a nearly equivalent (26 percent) reduction in methane. Clearly there’s a strong correlation between VOC-reducing technologies and reducing methane emissions. Plainly put, the largest source of emissions for Weld County is today, by law, much more tightly controlled, and emissions have been reduced significantly. The study claims that pneumatic devices are responsible for roughly 13 percent of VOC emissions, the second largest single source (NOAA study, p. 7). But again, the mobile lab data collected by NOAA is from 2008. And the state’s regulations, in addition to covering condensate tanks, also required the utilization of no-bleed or low-bleed pneumatic devices as of February 1, 2009 (with retrofits for existing systems required by May 1, 2009). (Code of Colorado Regulations, 5 CCR 1001-9, XVIII). U.S. EPA, on impacts from low-bleed pneumatic devices: “Reductions in methane emissions can range from 45 to 250 Mcf per device per year, depending on the device and the specific application” (EPA, November 2011 [PDF]). The EPA classifies high-bleed pneumatics as any device that emits more than 50 Mcf of methane per year, which means these devices reduce methane emissions by as much as (and often more than) 90 percent. Once again, the NOAA study is relying on data from an operating environment that no longer exists. For a basis of comparison, the study included emissions data as recorded from several NOAA observation towers throughout the country. 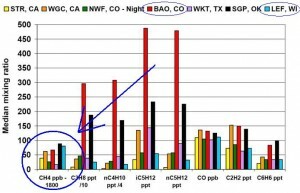 These included two in California, two in Colorado (one of which, the Boulder Atmospheric Observatory (BAO) was utilized for data collection in this particular study), and one each in Texas, Oklahoma, and Wisconsin. There could be a legitimate reason for this, but the NOAA study provides no real explanation about why a tower far removed from any industrial activity and located in a federally protected forest would record higher methane emissions. The researchers suggest it is difficult to make conclusions about methane levels because methane is a “long-lived gas” (NOAA study, p. 17). 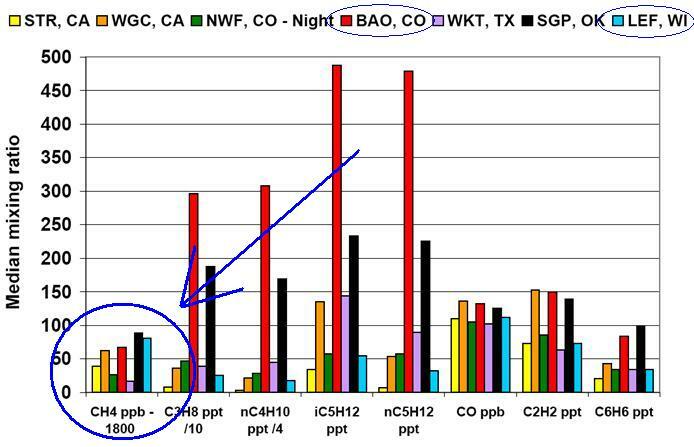 Because the NOAA study appeared to show high methane emissions from natural gas systems, the press immediately began linking it to the widely discredited Cornell study on shale gas emissions. Nature, for example, wrote that the study’s conclusions fall “roughly in line” with the Howarth paper, and even solicited input from Howarth on the study.